After World War II, the Army learned that an artillery barrage produces the most casualties in the first few seconds before the enemy could seek cover. 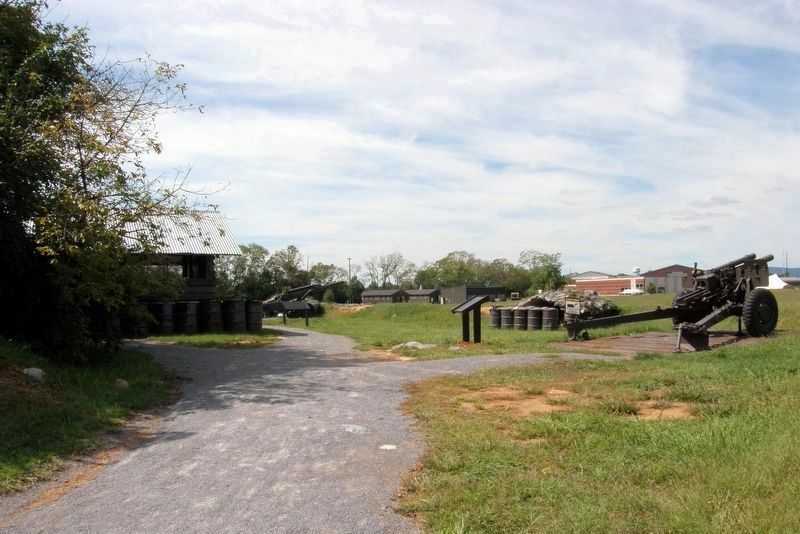 In response, the Army learned to time fire from multiple sources to arrive on a target simultaneously to deliver as much firepower in as short a period of time as possible. This method of firing is referred to as Time on Target (TOT). Synchronizing fire from multiple sources requires complex planning and calculations that can be achieved in several ways. A single cannon can hit one target with two shells at the same time by quickly changing the firing angle between shots. Alternately, helicopter gunships, jet aircraft, and other cannons can coordinate their fire to impact the target at the same time. TOT was used to inflict maximum casualties but had other uses. In Vietnam, TOT was often used to clear helicopter landing sites of trees and brush. Once cleared, helicopters could land to evacuate wounded soldiers and deliver supplies and/or reinforcements. Caption: An AH-1 Cobra helicopter launching rockets. Two rockets are already inflight, a third is just leaving the launch tube. the velocity by changing the amount of propellant used, or through a combination of these methods. The remaining text presents mathematical problems for solution by Middle and High School students. Erected by G.B. Stuart Charitable Foundation. Location. 40° 12.319′ N, 77° 9.444′ W. Marker is in Carlisle, Pennsylvania, in Cumberland County. Touch for map. The marker is on the U.S. Army Heritage Trail on the grounds of the U.S. Army Heritage and Educational Center in Carlisle PA. Marker is in this post office area: Carlisle PA 17013, United States of America. Touch for directions. Other nearby markers. At least 8 other markers are within walking distance of this marker. One-Oh-Five (here, next to this marker); Vietnam Fire Support Base (a few steps from this marker); 360 Degrees of Fire (a few steps from this marker); Selfless Service (within shouting distance of this marker); The Battle of the Ia Drang Valley (within shouting distance of this marker); Bill Beck and Russell Adams (within shouting distance of this marker); Duty (within shouting distance of this marker); The Ia Drang Battlefield (within shouting distance of this marker). Touch for a list and map of all markers in Carlisle. 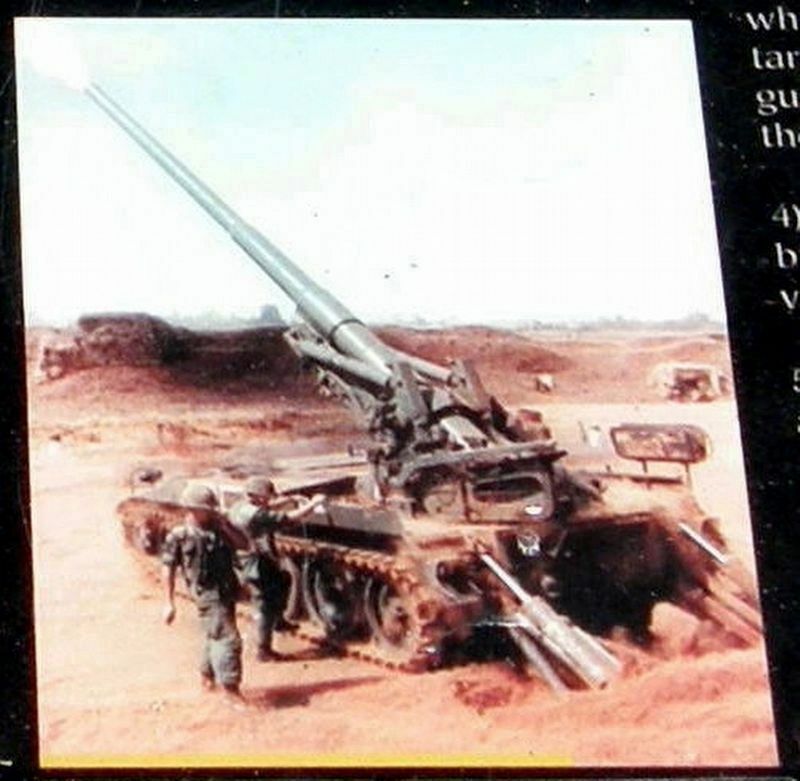 Caption: A 175mm M107 Gun, Operation San Angelo, Vietnam, 1968. 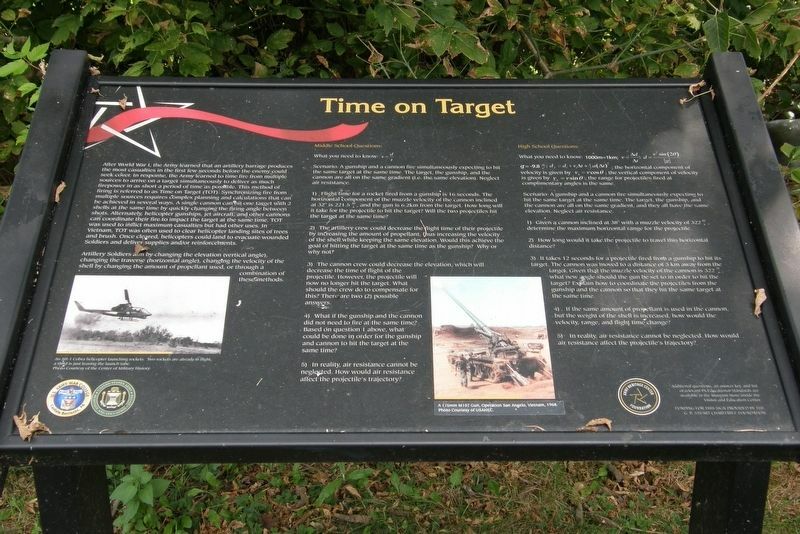 The Time on Target marker has been recently added near the trees to the left. More. Search the internet for Time On Target. Credits. This page was last revised on September 15, 2018. This page originally submitted on September 13, 2018, by Larry Gertner of New York, New York. This page has been viewed 42 times since then and 7 times this year. Photos: 1, 2, 3, 4. submitted on September 13, 2018, by Larry Gertner of New York, New York. • Andrew Ruppenstein was the editor who published this page.